The previous posts laid out the development of a specifications grading system. When I actually implemented the system in 2014-2015, I ran into two major problems: confusion and anxiety. I've made a number of changes to, hopefully, mitigate those problems. I'll update next year with my success (or lack thereof). There is a lot of good information in Linda Nilson's book Specifications Grading, but I found my specific problems were not detailed in the book, perhaps because I'd already taken her advice for dealing with the problems she covered. I devoted an entire page of my syllabus to explaining the specifications grading system. I described it in detail in class, multiple times. After the first graded assignment, I showed students how it fit into the system. At the end of each unit, I went over the grading system again and gave students a personal update on their grades. Very few students understood the grading system on the first day, but around 90% of them understood it after the first unit exam. Even they were annoyed by the complexity of the grading system because I had to keep explaining it in class for those who didn't understand. 1. Find an analogy/example students can understand. I tried a variety of ways to explain and defend the grading system. Students are so used to the standard grading system (90%+ = an A, 80%-90% = a B, etc.) that they found the idea of a mastery system extremely confusing. Even after they understood the basics, students had trouble understanding why it didn't matter whether they got an 80% or a 100% on their multiple choice exam, just as long as they passed it. Through trial and error, I found a couple of analogies/examples that helped my students understand the grading system. YMMV. One example that worked was the one I used in my first post: my high school chemistry class. That class consisted of self-paced units, each with associated lab work, homework, and an exam. You had to pass the exam with at least a C to move on to the next unit. Your final course grade was entirely dependent on how many exams/units you passed, not on your percentage grade on the exams. If you only did a couple units, you'd fail. If you did ten or more, you'd get an A. Since the first units covered very basic material and the later units covered more complex material, if a student got a D that meant they had mastered only the basic concepts, while an A reflected mastery of more advanced material. Although my BioAnth class is not self-paced, and every student has to complete some aspect of the three course units, they still found this example helpful in understanding the difference between a percentage-based grading system and a mastery-based grading system. The visual analogy that proved most effective was a (wonky-looking) tree or upside-down pyramid. To pass the course, all students must master the foundation/root work (D-level material), while higher grades required climbing higher (and covering more material). 2. Label graded activities carefully. Even if you have a complex class structure, by carefully choosing your labels for graded activities, you can make the grading system appear simpler. In my BioAnth class, I have a lot of different assessed activities: in-class writing, out-of-class writing, multiple-choice exams, essay exams, labs, in-class activities, worksheets, etc. Originally, I went through these activities and assigned each a grade level, then asked students to do only those activities that pertained to the grade they wished to obtain (and those of the grades below, of course). So D-level students had to do the D-level in-class writing, multiple-choice questions, labs, etc. C-level students did those, as well as all the C-level in-class writing, multiple-choice questions, labs, etc. It seemed relatively straight-forward to me, but it wasn't. Students got confused about what material they needed to cover and they lost track of deadlines. I revised the system so that all the assessments that are required for a particular grade have the same label (even if they're not necessarily identical activities, and even if there are similar activities that aren't required.) For example, I assign weekly short essays. 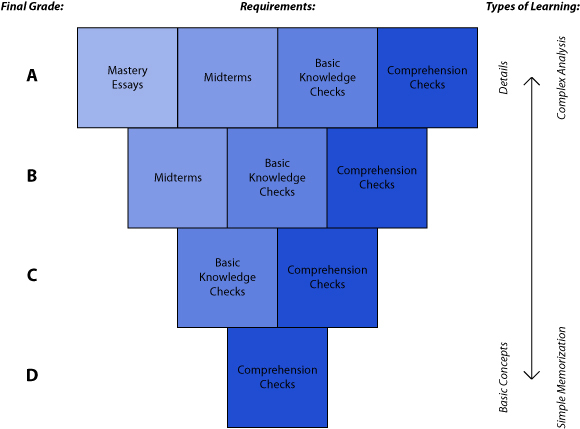 Originally, these were all called "comprehension checks" and I gave each essay a grade level; students who wanted a D in the class had to write the D-level comprehension checks. Students who wanted a C in the class needed to only write the D-level and C-level comprehension checks, etc. This was much too complicated. Now, I have divided the same weekly essays into two categories. The easier ones, the ones that cover basic concepts, I call "comprehension checks". All students who want a D or higher must pass them. The essays that require a more sophisticated understanding of the material I call "mastery checks", and they need only be completed by students who want an A. Similarly, I divided my previous exams (which had multiple choice, fill-in-the-blank, and essay questions) into different sections, gave them different labels ("basic knowledge checks" for the multiple-choice questions vs. "midterm" for the fill-in-the-blank and applied skills questions), and scheduled them for different days. Students no longer have to ask "what sections of the exam must I do? ", they know they need to take all "midterms" and/or all "basic knowledge checks". As I laid out in the previous post, all the activities for a particular grade are given the same label on the syllabus, making it easier for students to understand what they need to do and when. I'll talk about dealing with student anxiety in my next post.